Here is a screenshot of the chrome extension with the four scores, the overall score, and with a yellow-green background since it's 2.3/5. Our inspiration for SurfShield was the Hack Harassment initiative. The internet can be very useful, but due to its anonymity, it can also be used for cyberbullying and for posting vulgar and offensive content. We wanted to develop a way to let online users know whether the content of the page they are visiting is considered offensive. To do this effectively, we incorporated various apis and aggregated metrics that help to better inform the user. SurfShield is a chrome extension. 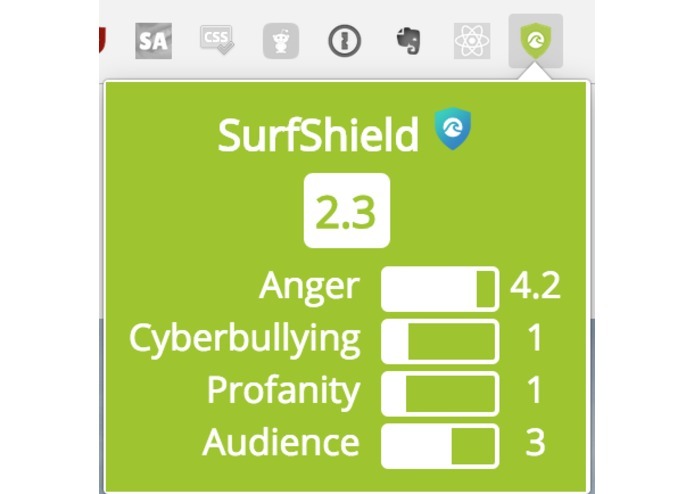 When a user visits a site, the SurfShield icon will change colors to display the level of offensive content on the page with green representing little to no offensive content and red representing a high level of offensive content. When the user clicks on the SurfShield icon, the extension will display an overall score, which is between 1 and 5. This score is averaged from from our four main metrics, which are anger, cyberbullying, profanity, and if users have voted on that particular site, an audience score. One main challenge we had was determining where the API calls would be made and the results processed. It was also challenging to integrate the separate parts that we all worked on to create a functioning Chrome Extension. We're proud that we've created an extension that will help those who are worried about viewing offensive content on the web. We imagine that many parents would like to have this extension for Chrome, so that there kids can surf the web in a safer environment. 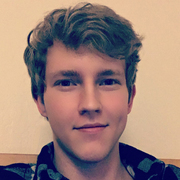 The extension is useful for anyone that wants a better and safer experience on the web. We learned a lot about the Watson Tone Analyzer as well as the Bark API, which greatly assisted us in our goal of determining the level of offensive content on a website. We all collaboratively worked together and used our own knowledge to make the Chrome Extension. SurfShield has great potential. We believe that in the future, it could allow parents to set it up so that if a site has a score above a threshold, it will block that site from use, so that children can surf the web without their parents having to look over their shoulder. In this case, the service could be monetized and sold on a monthly subscription basis. Junior at Dartmouth College; hacker, coder, and inventor.